Press release follows. 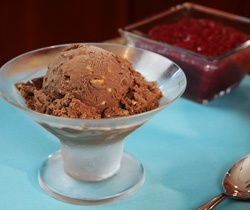 With bonus chocolate ice cream recipe (and photo). There would be a link to their website, but they seemed to have missed that one too. Ouch. Enjoy… assuming you remember what Karo corn syrup looks like. –(BUSINESS WIRE)–Labor Day marks the end of summer, a time for families to soak up the last few days of sun together. And, of course, the long holiday weekend calls for outdoor parties where summer treats are served and savored. Karo Syrup’s Deep Dish Cherry Pie and Rich Chocolate Almond Ice Cream recipes are guaranteed to deliver a lasting taste of summertime. These homemade desserts are perfect for any Labor Day celebration and sure to be the cherry to top off your summer! Drain cherries and reserve juice. Mix 1/2 cup cherry juice with corn starch. Add sugar, lemon peel, salt, corn syrup, butter, almond extract and food coloring; stir until combined. Stir in cherries. 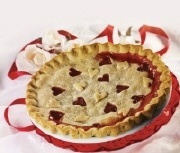 Assemble pie by placing one crust in pie pan. Pour in filling. Place remaining pie crust over filling. Flute edges and cut slits in top crust. Bake for 10 minutes; reduce heat to 350°F and bake 40 minutes longer or until lightly browned. Serve warm with vanilla ice cream, if desired. Combine sugar, cocoa, corn starch and salt in a 3-quart saucepan. Gradually stir in milk until smooth. Stir in corn syrup and egg yolks. Bring to boil over medium heat, stirring constantly; boil 1 minute. Pour into a large bowl; press plastic wrap to surface of mixture. Refrigerate at least 2 hours or until chilled. Stir cream and vanilla into chilled custard mixture. Freeze in a 2-quart ice cream freezer following manufacturer’s instructions. Add almonds 5 minutes before removing from ice cream freezer. Transfer to freezer container; cover and freeze until desired firmness is reached. Coconut Variation: Add 1/2 to 3/4 cup sweetened flaked coconut (toasted if desired) along with almonds.